Advances in Chemistry Research. Volume 50 opens with a discussion of the analytical chemistry of amlodipine from the perspective of drug purity control and stability indicating assays for quality assurance purposes. The synthesis and stability of the heterocycle is examined in conjunction with the determination impurities in different scenarios. Other specific aspects such as phase transitions, the determination of genotoxic impurities, and the enantiomers of the drug are also discussed. 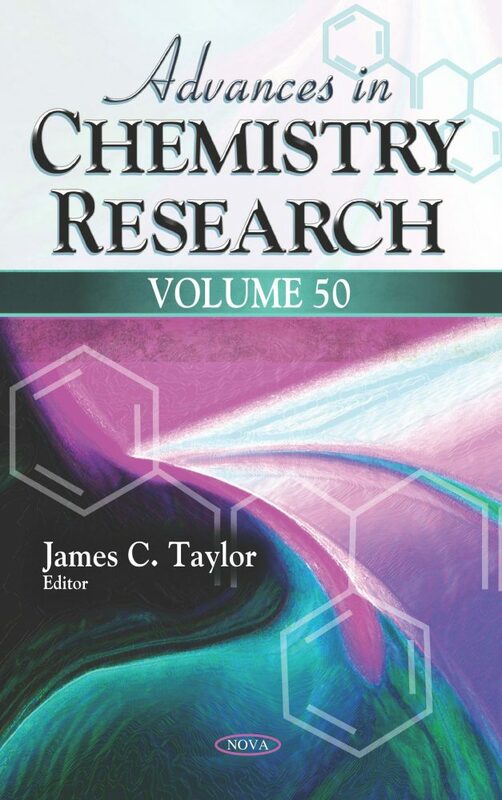 The following chapter focuses on the numerical investigation of the trends in the flow patterns and the corresponding characteristics of the chemical reactions that develop for different flow path geometries incorporating features typically found in engineering systems. These geometries include a straight flow channel, a constricted channel, a channel with a roughened surface, a channel with a junction, and then a channel with an expansion and contraction including an open expansion, an expansion with a filter, with baffles, a flow obstruction, and a roughened surface. The authors go on to discuss carbonylation reactions of important homogeneous and heterogeneous catalysts, development of carbon monoxide surrogates and future aspects. The carbon monoxide molecule has gained immense interest as one-carbon source building block through C–C bond formations in many catalytic carbonylation reactions for producing fine and bulk chemicals. The closing chapter discusses the most important aspects of liquid-liquid extraction of ion-association complexes: association and extraction equilibria, ion-association reagents, organic solvents, side processes and their manifestation, and methods for determining composition and equilibrium constants. It systematizes information on the classical liquid-liquid extraction of ion-association complexes which can help investigators take full advantage of the high chemical-analytical potential of these compounds.